The network components consist mainly of the hubs, switches, routers (and whatever else you fancy hooking up there), that allow your machines to connect and talk to other machines, be they on the same network, or, on the other side of the world. There are hundreds of types of devices available, from budget manufacturers such as Netgear (extremely good kit, IME) up to major equipment manufacturers such as Alcatel (every home deserves an OMNI Switch, I reckon;-)) and they come in a combination of sizes and functionality. Unfortunately, I don't have an OMNI Switch so you'll have to deal with the Netgear instead. Small and compact, this particular hub (Model EN-104) can accomodate up to four devices, with one of the ports selectable for normal/cross-over operation. This is identified in the diagram as uplink, and it has a push-button located adjacent to it so that the operation can be manually set. You would only need to use the uplink facility, however, if you were connecting a router, or another hub, to the hub and an actual cross-over cable was not available. 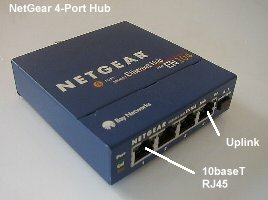 This particular Netgear hub also has additional connectivity features in that it also has a BNC connector on the reverse for a 10base2 connection (see 10base2 below), and this can be used to connect existing 10base2 LANs to the RJ45 Media that is required by the Cable Modem. Switches perform a similar function to hubs, but they have slightly more intelligence and can accomodate devices with differing speeds, so you could have a 100M device connected to one port and a 10M device connected to another. In addition switches differ from hubs in the way they distribute the data between devices. A device sending data through a Hub, will have it's data sent to every device attached the same hub. The same device connected to a Switch will find it's data only being sent to the destination device. The Switch does this by only sending the data to just the destination MAC address, rather than sending it to all. The following diagrams illustrate the difference in data distrubution when a hub is used compared to a switch. Hubs generally have little intelligence regarding the destination of the data they propagate between the devices connected to it. Any data that is received at one port is transmitted to all devices attached to the hub, including other hubs, which could, in turn, then distribute the data to it's connected devices as well. In a switched environment, the data transmitted between the devices attached to a switch is only distributed to the ports used by the devices actually maintaining a connection. The exception to this is network traffic such as broadcast traffic, where, for instance, devices have yet to establish a connection TCP/IP, or are making DHCP requests for IP addresses from a DHCP server. Another advantage with using a switch is that it is possible to mix devices that communicate with different speeds, so one of the PCs connected to the switch could be running 10MB Half-duplex and another 100MB Full-duplex.